Louis-Eugène Cavaignac (French pronunciation: ​[lwi øʒɛn kavɛɲak]; 15 October 1802 in Paris – 28 October 1857) was a French general who put down a massive rebellion in Paris in 1848, known as the June Days Uprising. This was a 4-day riot against the Provisional Government, in which Cavaignac was the newly appointed Minister of War, but soon had to be granted dictatorial powers in order to suppress the revolt. By adopting ruthless methods, he achieved his objective, though some have claimed that he spent too long preparing for the operation, allowing the mob to strengthen their defences. He received the thanks of parliament, but failed to be elected president, losing heavily to Louis-Napoleon Bonaparte. Louis-Eugène Cavaignac was the second son of Jean-Baptiste Cavaignac and brother of Éléonore Louis Godefroi Cavaignac. After going through the usual course of study for the military profession, he entered the army as an engineer officer in 1824, and served in the Morea (Peloponnesus) in 1828, becoming captain in the following year. When the revolution of 1830 broke out he was stationed at Arras, and was the first officer of his regiment to declare for the new order of things. In 1831 he was removed from active duty in consequence of his declared republicanism, but in 1832 he was recalled to the service and sent to Algeria. This continued to be the main sphere of his activity for sixteen years, and he won special distinction in his fifteen months' command of the exposed garrison of Tlemcen, a command for which he was selected by Marshal Bertrand Clausel (1836–1837), and in the defence of Cherchell (1840). 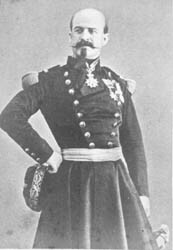 Almost every step of his promotion was gained on the field of battle, and in 1844 Henri d'Orléans, Duke of Aumale himself asked for Cavaignac's promotion to the rank of maréchal de camp. This was made in the same year, and he held various district commands in Algeria up to 1848, when the provisional government appointed him governor-general of the province with the rank of general of division. The post of minister of war was also offered to Cavaignac, but he refused it[clarification needed] owing to the unwillingness of the government to quarter troops in Paris, a measure which the general held to be necessary for the stability of the new régime. On his election to the National Assembly, however, Cavaignac returned to Paris. When he arrived on 17 May he found the capital in an extremely critical state. Several riots had already taken place, and by 22 June 1848 a formidable insurrection had been organized – it would be known as the June Days Uprising. The only course now open to the National Assembly was to assert its authority by force. On 24 June, the Executive Commission was defeated by a vote of no confidence and Cavaignac appointed President of the Council of Ministers with emergency powers, effectively making him dictator. Cavaignac was called to the task of suppressing the revolt. It was no light task, as the national guard was untrustworthy, regular troops were not at hand in sufficient numbers, and the insurgents had abundant time to prepare themselves. Variously estimated at from 30,000 to 60,000 men, well armed and organized, they had entrenched themselves at every step behind formidable barricades, and were ready to avail themselves of every advantage that ferocity and despair could suggest to them. Cavaignac failed perhaps to appreciate the political exigencies of the moment; as a soldier he would not strike his blow until his plans were matured and his forces sufficiently prepared. When the troops at last advanced in three strong columns, every inch of ground was disputed, and the government troops were frequently repulsed, requiring reinforcement by fresh regiments, until he forced his way to the Place de la Bastille and crushed the insurrection at its headquarters. The contest, which raged from 23 June to the morning of 26 June, was without doubt the bloodiest and most resolute the streets of Paris have ever seen, and the general did not hesitate to inflict the severest punishment on the rebels. Cavaignac was censured by some for having, by his delay, allowed the insurrection to gather head; but in the chamber he was declared by a unanimous vote to have served his country well. After laying down his dictatorial powers, he continued to preside over the Executive Committee till the election of a regular president of the republic. It was expected that the suffrages of France would raise Cavaignac to that position. But the mass of the people, and especially the rural population, sick of revolution, and weary even of the moderate republicanism of Cavaignac, were anxious for a stable government. Against the five and a half million votes recorded for Louis Napoleon, Cavaignac received only a million and a half. Not without chagrin at his defeat, he withdrew into the ranks of the opposition. Cavaignac continued to serve as a representative during the short remainder of the republic. At the coup d'état of 2 December 1851 he was arrested along with the other members of the opposition; but after a short imprisonment at Ham he was released, and, with his newly married wife, lived in retirement till his death at Ourne (Sarthe). For a more critical look at Cavaignac's actions from 23 to 26 June, one can find documentation in Mikhail Bakunin's Statism and Anarchy from pages 157 – 159. Cavaignac's actions are described as the inspiration to the later Prussian suppression of the National Assembly in Frankfurt and its supporters. His son, Jacques Marie Eugène Godefroy Cavaignac was a prominent politician. Wikimedia Commons has media related to Louis-Eugène Cavaignac. This article incorporates text from a publication now in the public domain: Chisholm, Hugh, ed. (1911). "Cavaignac, Louis Eugène" . Encyclopædia Britannica. 5 (11th ed.). Cambridge University Press. p. 561. Denis-Auguste Affre was Archbishop of Paris from 1840 to 1848. He was killed while trying to negotiate peace during the June Days uprising of 1848. Nicolas Anne Theodule Changarnier, French general, was born at Autun, Saône-et-Loire. 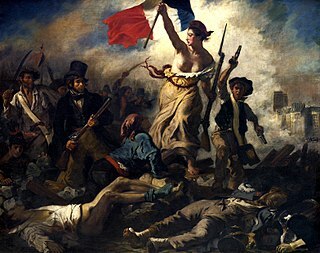 The Revolutions of 1830 were a revolutionary wave in Europe which took place in 1830. It included two "romantic nationalist" revolutions, the Belgian Revolution in the United Kingdom of the Netherlands and the July Revolution in France along with revolutions in Congress Poland and Switzerland. It was followed eighteen years later, by another and possibly even stronger wave of revolutions known as the Revolutions of 1848. The French coup d'état of 2 December 1851 was a self-coup staged by Prince Louis-Napoléon Bonaparte. It ended in the successful dissolution of the French National Assembly and the subsequent re-establishment of the French Empire the next year. When he faced the prospect of having to leave office in 1852, Louis-Napoléon staged the coup in order to stay in office and implement his reform programs; these included the restoration of universal male suffrage. His political measures, and the extension of his mandate for 10 years, were popularly endorsed by constitutional referendum. A mere year later, the Prince-President reclaimed his uncle's throne as Emperor of the French under the regnal name Napoleon III. The June Days uprising was an uprising staged by the workers of France from 23 to 26 June 1848. It was in response to plans to close the National Workshops, created by the Second Republic in order to provide work and a source of income for the unemployed, albeit with pay just enough to survive. The National Guard, led by General Louis Eugène Cavaignac, was called out to quell the protests. Things did not go peacefully and over 10,000 people were either killed or injured, while 4,000 insurgents were deported to Algeria. This marked the end of the hopes of a "Democratic and Social Republic" and the victory of the liberals over the Radical Republicans. The Executive Commission of 1848 was a short-lived government during the French Second Republic, chaired by François Arago, that exercised executive power from 9 May 1848 to 24 June 1848. It succeeded the Provisional Government of 1848 and was in turn replaced by the Cabinet of General Cavaignac. The members of the Commission acted as joint head of state. The cabinet of General Cavaignac was the government of France from 28 June 1848 to 20 December 1848. It replaced the Executive Commission of 1848 after the June Days Uprising of 23 June to 26 June 1848. General Louis-Eugène Cavaignac (1802-1857) was given executive power by the National Assembly and headed the government as President of the Council of Ministers. The government was replaced by the first cabinet of Odilon Barrot on 20 December 1848 after Louis Napoleon had been elected as President. Alexandre Pierre Freslon was a French Lawyer who became a representative in the Constituent Assembly and Minister of Public Education and Religion in 1848. Ferdinand Flocon was a French journalist and politician who was one of the founding members of the Provisional Government at the start of the French Second Republic in 1848. He was Minister of Agriculture and Commerce for the Executive Commission of 1848. He opposed Louis Napoleon and was forced into exile in the Second French Empire (1852–1870). Count Edmond-Charles de Martimprey was a French soldier, briefly Governor General of Algeria, and then Senator of France for the remainder of the Second French Empire.